Heart Rate Variability (HRV) is a statistical analysis of the small variations in time intervals between heartbeats. These variations are a normal physiological phenomenon. Studies have shown that changes in HRV are associated with a wide range of diseases as well as pain, stress and obesity. HOW DOES HRV REFLECT DOG AND CAT HEALTH? HRV has long been recognized as a marker for autonomic nervous system activity. The autonomic (parasympathetic and sympathetic) nervous systems as well as hormonal factors provide the main input to the heart’s pacemaker, and the beat-to-beat interval variability is a reflection of the balance between these two. Clinical research has documented reduction in HRV (decreased variability) in various disease states. Papers published in veterinary journals have shown that reduction in HRV is associated with heart diseases, sepsis, diabetes, obesity, and more. HRV has also been shown to be reduced in states of chronic pain and stress in humans and lab animals. It is the first objective, remote, non-invasive, quantifiable marker for pain. High HRV indicates good fitness level and a healthy heart and nervous system. Low HRV is associated with stress, pain, heart disease and other pathologies. Previously, measurement of HRV required Holter monitoring, which is clumsy and complex, and not practical for widespread use in general veterinary medicine. 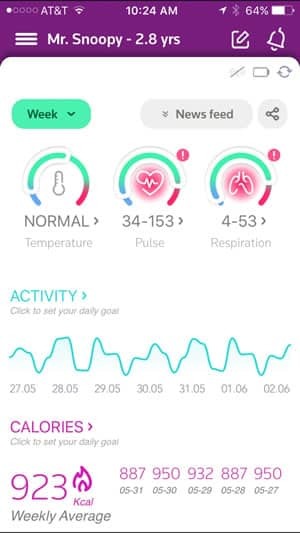 The PetPace collar is able to constantly measure and report HRV, helping caregivers better monitor pets with certain diseases as well as pain or stress.